Embedded power supplies combine traditional power supply components with multiple sensors, processing and control logic as well as digital communications interfaces. Test equipment for debugging requires isolated input channels for measurements of hazardous voltages. Additional digital channels support the analysis of digital signals, while trigger and decode capabilities are essential for time-correlated monitoring of serial protocol-based communications interfaces. Evaluate the operation of an embedded AC/DC power supply that is built from two programmable converters. Monitor the converters’ input and output signals timecorrelated to the protocol-based programming and control interface while the power supply is switched on. The R&S®Scope Rider handheld digital oscilloscope combines the advantages of an isolated handheld oscilloscope with the functionality formerly seen only in modern laboratory-class oscilloscopes. Each galvanically insulated input channel provides up to 500 MHz bandwidth with measurements possible in environments up to CAT IV 600 V/CAT III 1000 V.
The R&S®Scope Rider also features logic analyzer and protocol analyzer capabilities thanks to eight digital channels (MSO) and various protocol trigger and decode options (e.g. I2C or UART). The high sample rate of max. 5 Gsample/s allows you to analyze signal details such as fast transitions with high resolution. The fast update rate of 50000 waveforms/s catches rare signal events quickly. The capacitive touchscreenbased operation supports intuitive use of the instrument. The demand for more efficient power supplies is increasing. It is being driven by mobile applications, where battery saving is a concern, and high-power industry or data storage applications, where changes in power requirements need to be addressed quickly or high reliability needs to be assured. Embedded power supplies include traditional AC/DC or DC/DC converters as well as digital monitoring, processing and communications components. The main system can communicate with the embedded power supply to set up and adjust parameters or to monitor critical characteristics such as temperature or overload state. A popular communications interface for embedded power supplies is the PMBus, based on the physical layer of the two-wire I2C communications interface. In the following example, two high-performance 500 W AC/DC converter modules are combined in one power supply. Both modules feature independent digital control systems with the PMBus protocol over the standard I2C bus as communications interface. As both modules have an individual I2C address, dedicated PMBus commands can be sent to each module. This allows remote configuration of the converter modules including input and output voltages, current sharing or maximum output power. Detailed monitoring of the overall power supply unit is also possible. 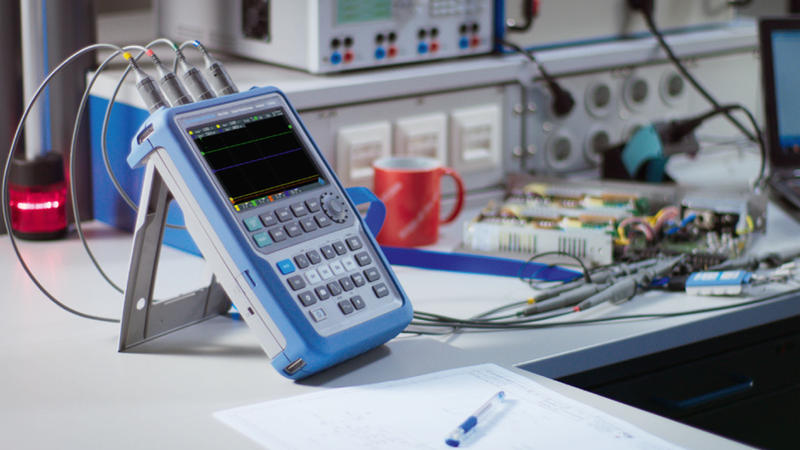 For the discussed measurement, the input channels of the R&S®Scope Rider are connected to the power supply input and output lines and the power good signal. The isolated channels of the R&S®Scope Rider are important in order to protect the user from the dangerous mains voltage when measuring on the primary side of AC/DC converters. 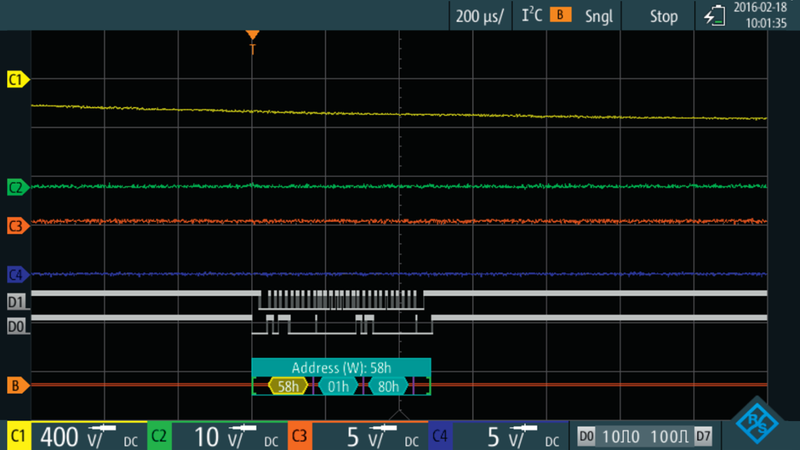 Two digital channels of the MSO option of the R&S®Scope Rider are connected to the I2C clock and data signals (I2C_SCL and I2C_SDA) and configured. For the actual measurement, the trigger event “Start” for the I2C message is selected. 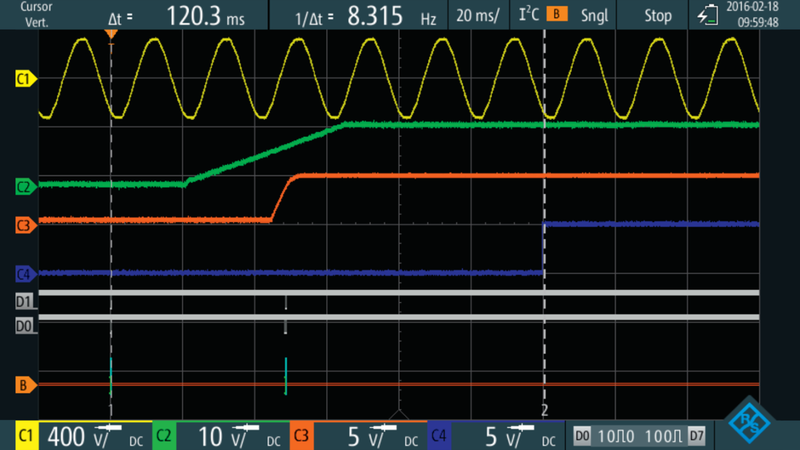 Armed with a trigger mode “Single”, the R&S®Scope Rider responds to the I2C command issued by the user, and acquires the startup sequence of the power supply, as shown in the screenshots below. The screenshots show the ramp of the two output voltages and the power good signal, indicating the power supply is ready for operation. Further characteristics, such as the time delay of the individual output ramps relative to the I2C command, can be verified by the cursors or with automated measurements. The R&S®Scope Rider handheld digital oscilloscope features superior performance at the highest safety standards, combined with lab instrument functionalities such as MSO and protocol triggering and decoding options.